Occasionally I get asked what medicines/supplements I take for my PCOS, so I thought this would make a good post. Interesting, maybe not for non-PCOSers, but informative none-the-less. Before I start rattling off a list of drugs, I would like to point out that I have now had about 18 regular menstrual cycles in a row. Yep, you read that right, 18 months of periods! I guess regular is not a good word...they are not like exactly 28 days apart or anything, but wow. Never. Never in my life have I been this regular steady. I've talked about my absence of periods here, and with my history of few to none, I am most definitely happy to be having them now. I contribute my regularness (new word! yeah!) to my combination of meds and supplements. Do I use one of those little pill boxes? Yep! Do I feel like a little old lady? Yep! Does my husband occasionally poke fun at me for it? Yep! Do I sit down every Sunday morning and divvy out my pills? Yep! Does he call me a pharmacist? Yep! Do I look like a pharmacist counting out my little pills and putting them in to the right sections? Yep! 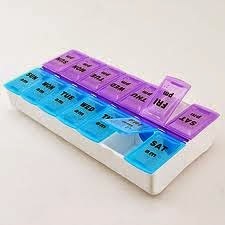 My pill box looks like this one. I got it at the Dollar Tree for, you guessed it, $1. The text has almost rubbed completely off of mine, but I use a sharpie and re-do it on occasion. I also learned the hard way that if you bend the little lids back too far, they will snap right off, leaving you with no other choice but to go spend another dollar! So why these specific vitamins? Keep reading, I addressed each one below. I kept it simple. I have done my research (online, discussions with my doctors, personal preference, trying different supplement combinations) and so can you. My "reasons" below are my personal reasons and definitely not the only things these vitamins can do for our bodies. I just listed the ones that really stick out for me. If you want more information, I encourage you to do your research. There is plenty out there, so I am not going post it all here. This post could go on for days! Just make sure your sources are reliable. What brand of vitamins do I use? Puritan's Pride. They are SO affordable and work well for me. (exception: Potassium Gluconate is from Walgreen's...) I actually linked you right to the ones I use in the first med list above. You're welcome! Their bottles are beautiful translucent colors too, with flip-top caps. It never hurts to have a little color :) I also buy coconut oil, Scott's vitamins, and other things from them. They do B1G2 and B2G3 sales a lot. Totally awesome!